Oh how I love birthday meals. Not only is it an excuse to go out to eat, if it your birthday, you don't even have to pay! I'm not sure how it all started, but for the last few years, we've been treating Viv's brother and wife to their birthday and vice-versa. Hey, I'm not complaining! With choice of restaurant, it seemed like an easy proposition, yet with 3 kiddies to accommodate, we chose something a bit more low-key. Oh, and food that the kiddies would eat too... 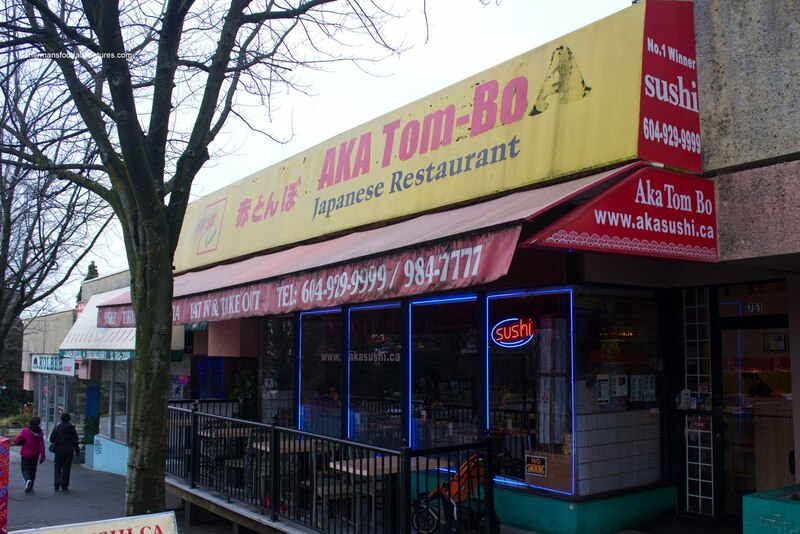 Seeing how we haven't been to the North Shore in awhile, we decided on AKA Tom-Bo on Lonsdale. Located right next to the Red Chilli, this Chinese-run Japane se restaurant has been the "winner of the best Japanese restaurant" in 2007 & 2009 according to the North Shore News. Now we all know that this really means nothing at all, but just FYI. Naturally, we had to sample their raw fish and we figured the Assorted Sashimi would do the trick. Vibrant and with a nice sheen, the sashimi was pretty good. 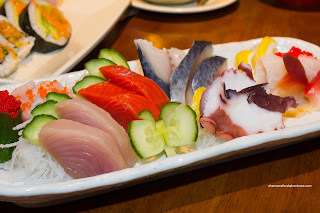 Consisting of tobiko, toro, albacore tuna, sockeye salmon, mackerel, tako, tai and hokkigai, there was nothing particularly amiss other th an the slight discolouration of the surf clam. 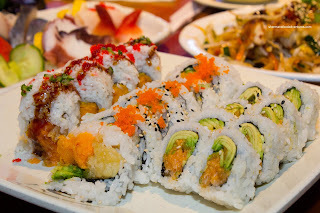 Looking over the specialty rolls, there were a few we really wanted to try. Of course we couldn't order all of them, so I took a look-see at the special lunch combos and realized that they were a really good deal. For the same price as one specialty roll, the combos consisted of 3 rolls (including specialty rolls albeit a bit smaller). Therefore, we ended up with 2 roll combos starting with #7 which included half a Sakura Roll, Sweet Dynamite Roll and Spicy Tuna & Avocado Roll. The Sakura Roll consisted of imitation crab, mashed yam and cucumber topped with masago, green onio n, unagi sauce and mayo. The addition of sweet yam made the roll, well, sweet. Fortunately, the unagi sauce had a touch of saltiness and when dipped into soy sauce, it achieved some balance. As for the sushi rice, it was not bad with some chew, although a little bland. 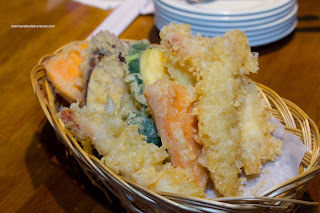 The Sweet Dynamite had cucumber, avocado, ebi tempura and mashed yam on the inside topped by tobiko on the outside. It appears they have a love for mashed yam at this place. The flavour profile of this roll was quite close to the Sakura Roll, without the unagi sauce and mayo. 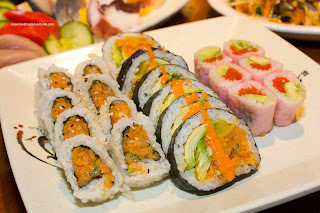 Not a whole lot to comment on the Spicy Tuna and Avocado Roll other than the fact that it wasn't really all that spicy. We also got combo #13 which included the North Shore Roll, Soy Wrap Salmon Maki and a Spicy Tuna Roll. In the middle of the plate lay the North Shore Roll consisting of avocado, mashed yam, spicy tuna, white onion and oshinko with spicy sauce drizzled on top. Yah, they like their yams here and yes it was once again sweet. Loved the crunch and tartness of the oshinko which combined with the spicy sauce to counteract the sweet yam. They Soy Wrap Salmon Ma ki was pretty to look at, yet in the end, it was rather soft and lacking in flavour. Nothing inherently wrong with the ingredients, it just happened to work out that way. Once again, not gonna say much about the Spicy Tuna Roll because it was exactly like the previous one minus the avocado. 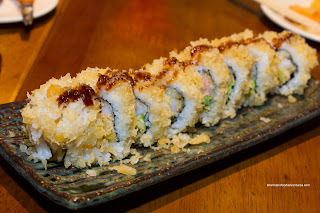 Due to my stupidity, we got another roll in the Crunch Roll which had imitation crab, avocado and ebi tempura in the middle with crunchy bits on the outside and a drizzle of unagi sauce. The roll was pretty predictable and was quite filling. Continuing with fried goodness, we had the Assorted Tempura which was mostly crispy and not too heavy. I say mostly crispy because some of the pieces had some soggy portions of batter on the inside. Nothing serious, but not great either. It could've had something to do with the large cuts of veggies (which was very generous of them though). 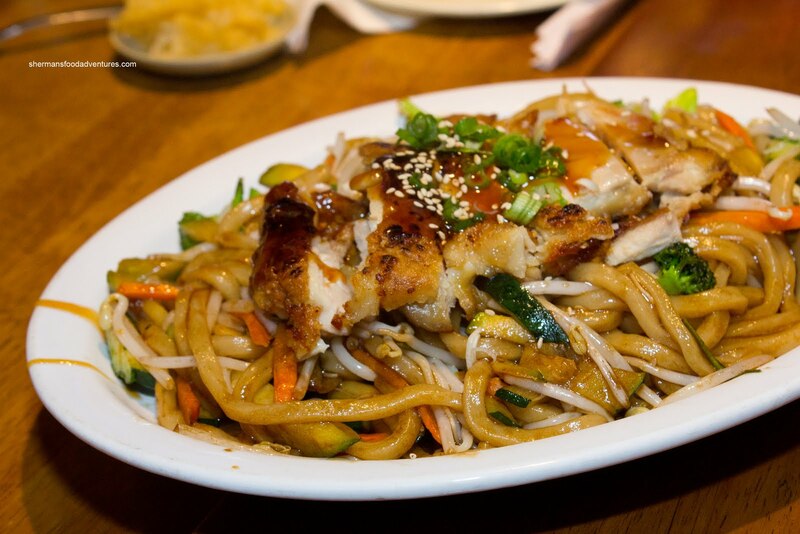 For the kiddies, we got the usual in the Chicken Yaki Udon. In this version, the udon was stir-fried and topped with a fried piece of chicken. This was a fairly large portion with a good noodle-to-veggie ratio. It was slightly wet, yet not incredibly so. I liked how it wasn't merely sweet since there was a nice acidity to the sauce. I'm not sure about the chicken on top business though, it felt disconnected with the rest of the dish. 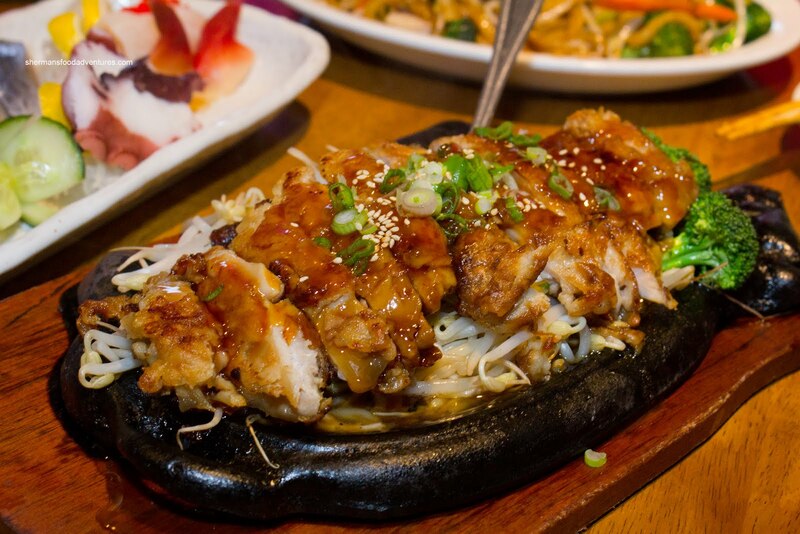 Lastly, we got something redundant in the Teriyaki Chicken. It was essentially the same without the udon noodles and a different sauce. The chicken was moist, however, the abundance of moisture at the bottom of the teppan plate resulted in a never-ending leak on the table (which continued to leak for awhile since they forgot the extra napkins we asked for). 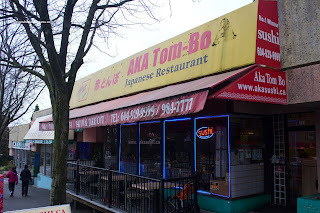 Given its location, Aka Tom-Bo does the job on the cheap. It ain't the best Japanese food out there, but it is above average.